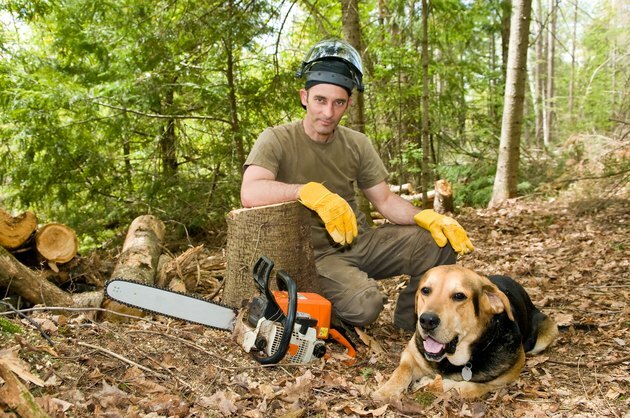 Husqvarna recommends adjusting the carburetor on the chain saw when you have filled the fuel tank ten times. This assures that the engine goes through the proper break-in period. Husqvarna recommends that a certified technician adjust the carburetor, but you can do it yourself and save some money. Adjusting a Husqvarna carburetor correctly ensures good fuel economy and protects the engine. When adjusting the chain saw carburetor, keep people and objects away from the chain bar to prevent damage and injury. 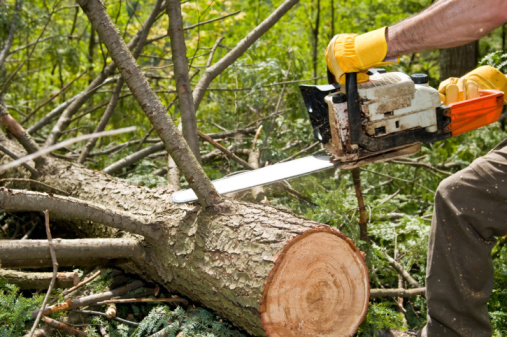 If the chain saw runs rough, the carburetor might require adjusting. Set the Husqvarna chain saw on a level surface. Ensure that there is nothing around the chain bar while you are adjusting the carburetor. Start the chain saw and allow the engine to warm for five minutes. Locate the three separate adjustment screws near the pull rope on the chain saw body. A letter is stamped next to each screw. Turn the screw with the "L" stamp clockwise with a screwdriver until the screw stops. Do not force the screw past the natural stop. Turn the screw counterclockwise until the engine idles smoothly without hesitation. Squeeze the throttle trigger to test the engine. Continue adjusting the "L" screw until the engine sounds smooth and accelerates smoothly. Place the screwdriver on the screw with a "T' stamp. This is the idle-adjustment screw. Turn the screw clockwise until the chain starts to turn on the chain bar. Immediately turn the screw counterclockwise until the chain stops turning. The engine should maintain idle speed without the chain moving on the chain bar. Rotate the "H" adjustment screw counterclockwise with the screwdriver until the screw stops. The engine should sound very rough. Turn the screw clockwise until the engine runs smoothly. Squeeze the throttle trigger. The engine should accelerate with little difficulty and not blow smoke from the exhaust.